For the uninitiated, dishoom dishoom is used in the Indian context to represent struggle or fight. It is uttered by children trying to show themselves as heroes fighting the villains. The usage originated from the Indian movies where a background "Dishoom" sound was played when the hero lands a punch on the bad guy. :) Google told me that there are some other meanings too..but that's not our point of interest. Our topic today is Bruges lace. Have you heard of it? Bruges is a place in Belgium and famed for its Bobbin lace and Bruges lace. In Bruges lace method tapes or ribbons are woven which are linked together to form pretty patterns. This is a loom based method, but some clever crocheters have devised ways to imitate the Bruges lace style using crochet. I first heard of it in the Passionate about Crochet group in FB. Some of the links provided in the CAL helped me get some idea. It looked so easy and I was tempted to try. Lesson learnt - Never judge a book by its cover. I have lost count of the number of times I watched the video, because of the twists and turns. The video being in Spanish also contributed a bit to the dishoom dishoom. Anyways, here's my work in progress. This doily is not crocheted in rounds but as a single tape of four DCs with a loop of 7 on either side. The thread is mercerized cotton and has a nice sheen to it. Unfortunately the light outside is not sufficient for a bright and sunny pic. I have completed almost 75% but there is still some more work left. 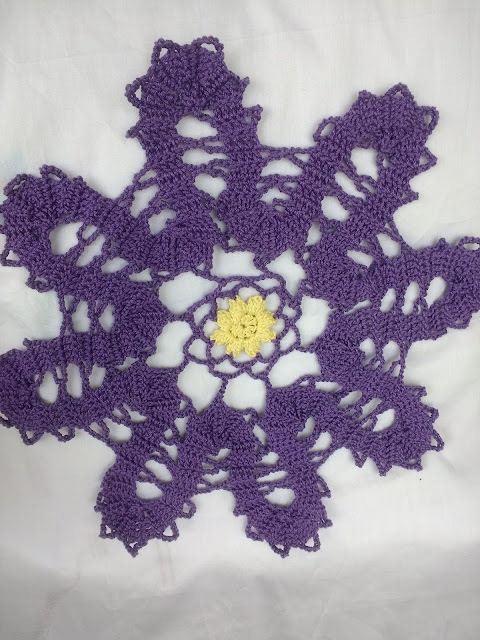 The doily is made in three parts - the center, the ribbon and then the outer layer. Here's the video tutorial in case some of you would like to try. I cannot understand anything that she says, except unos,dos,tres,quatro.. and the word motivo :) . But the video is very detailed. Usually I always make changes to a pattern to my liking. But I have still not figured this method out so I cannot improvise. On the other hand, with crochet I can do what I want. A couple of weeks back I completed a top for my daughter. Here it is.. It is a seamless piece crocheted from bottom to top. The inspiration came from this pattern here . 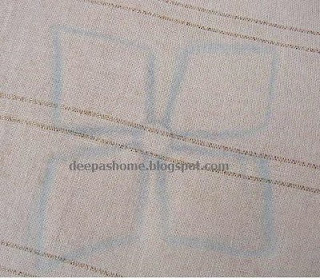 But I did not copy anything other than the chest portion in Triangle stitch. Mine was worked in rounds , starting with a ribbed bottom and using herringbone double crochet and doubled crochet alternately. The little lady loved it and has worn it quite a few times already. Now let me complete the doily and I'll be back with the completed piece soon. Though difficult, it feels good to have attempted something new. How about you? Do you enjoy the learning process? Have you planned to try something new this year? Struggle is right. And I am wrestling with silk shading, so watch out for dishoom dishoom from me, too! Love the top for your daughter! Wow, great pictures of your doily! As I saw the first picture I thought you had started lace making! I had a look at the video. It is long and detailed and I think you have followed it well as your doily is just a beautiful as the one in the video. 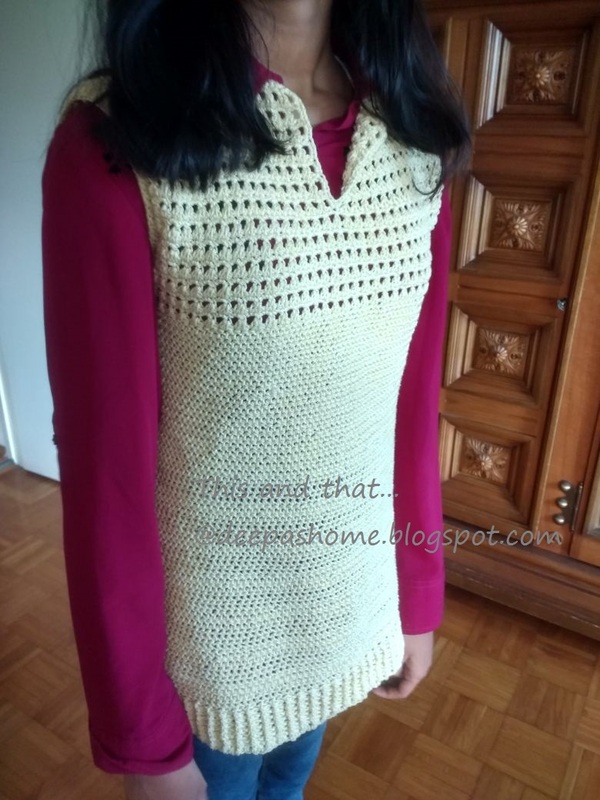 I bet there was no dishoom dishoom when you made the tunic for your daughter. It is very stylish and I understand she is happy to wear it. Lovely doily and the crochet top is pretty:) I have Bruges crochet on my to do list and there aren't enough free designs or tutorials. I like starting with medium difficulty level project and then failing and then coming back to beginner level ...lol but, sometimes, I succeed too. I also want to try Irish crochet and have a book as well for the same. Other than noticing that it is a densely crocheted with thin thread I find it similar to regular crochet. I will get to know the secret when I actually make it. Bruges lace looks interesting, I've pinned it to try later. The crochet top is lovely! Well done! I do love experimenting with new techniques, right now I am taking an ‘Artist Book’ course and guess what: I add a few stitches on the paper here and there (it is hard to stay away from embroidery!). I had never heard of this type of lace - looks interesting. And I love the term dishoom dishoom! lovely Bruges lace. 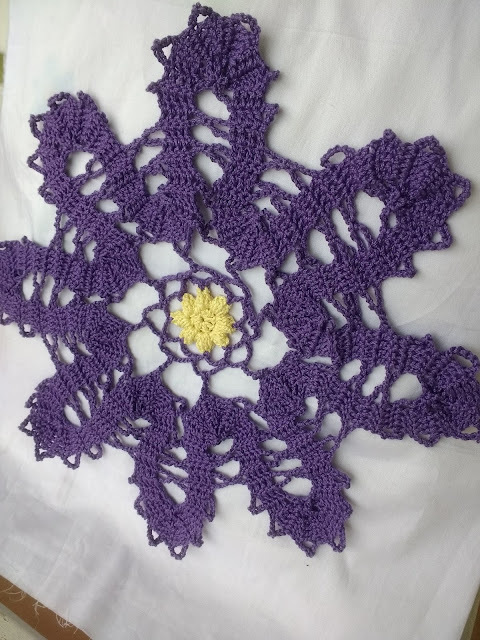 I have crocheted quite a few of these doilies .I'd be happy to help just in case you need any .P.S Feel free to contact me if you need a translator for Spanish.